You can’t reasonably call the Thunderbird Boutique Hotel on Las Vegas Boulevard a chip off the old block – and that’s a good thing. Although Las Vegas historians and longtime locals will quickly make the connection between its name and the original Thunderbird, the new T-Bird doesn’t rest on its nostalgic niche. Located at 1215 Las Vegas Boulevard North not far from the Stratosphere, it’s a hip take on a motor lodge and includes a wedding chapel emphasis. There’s no casino, at least not yet. It does, however, give me a chance to conjure the spirit of the old Thunderbird just enough to serve as a reminder of just how much times have changed in Las Vegas. In various iterations under different owners and names, it lasted from the late 1940s until the new century when it was finally cleared away to make space for the stylish Turnberry Towers high-rise project. 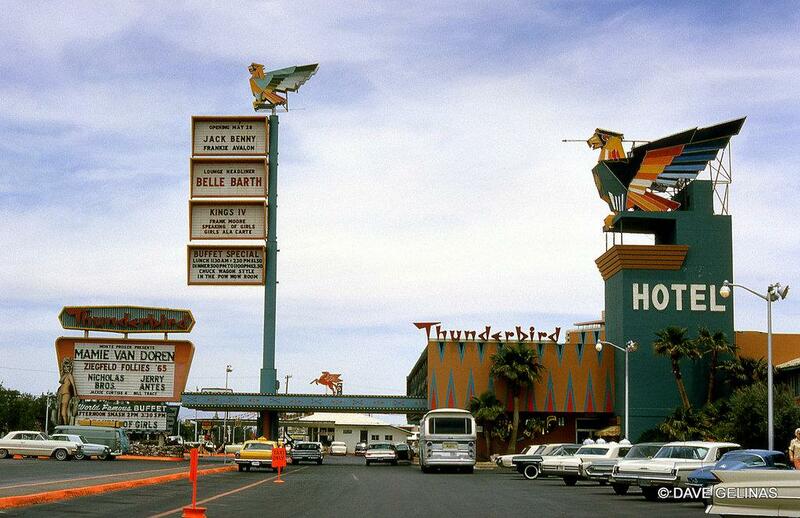 Late in his own colorful life, casino madman Bob Stupak toyed with a plan to reinvent the Thunderbird as a casino that might remind visitors of old Vegas. He hoped to return the Thunderbird to its previous glory, but like many projects he pursued in his final years the T-Bird dream remained on the drawing board. When the Thunderbird left its original drawing board, developers Marion Hicks and Nevada Lt. Gov. Cliff “Big Juice” Jones embarked on a perilous journey in the months after the murder of Benjamin Siegel. Not even Hicks and Jones had the juice to start construction at a time when building materials were still scarce. It was probably a good thing, for paying too much for post-war building materials (and then failing to keep track of the theft in his construction yard) is part of what helped put Siegel in such a difficult financial position at the Flamingo. By the time the Thunderbird opened on Sept. 2, 1948, it was more than a casino – it was an opportunity for the shadowed gaming industry to put the Siegel mess behind it. The Thunderbird’s advertising welcomed locals and visitors alike and at the outset, at least, didn’t generate scandalous headlines. That would come a little later. What it did do in steady succession was grow along with its financial fortunes, steadily adding casino space, rooms, a larger facade amenities. But, of course, eventually controversy found the front door and strolled on in. For his part, Jones was in a high political position to influence the Nevada Tax Commission. He was no stranger to making deals for pieces of the action downtown and on the fledgling Strip. As for Hicks, he took out a $160,000 loan from an associate of Meyer Lansky named George Sadlo. Lansky’s brother Jake was a constant presence on the property. When the tax commission went into action in the wake of the embarrassment it suffered during the Kefauver Committee racket hearings, the legal battle was on with Hicks and Jones. The fight went to the state Legislature, where the Thunderbird side appeared to prevail only to be interrupted with a last-minute reversal of fortune. Then it was on to the state Supreme Court, where the Tax Commission v. Hicks decision set the stage for the next generation of gaming law. Nevada gaming regulation still had a long way to go. In addition to the Thunderbird, Hicks was associated with the development of the El Cortez downtown and the Algiers motel, restaurant and lounge next to the Thunderbird. Throughout much of its existence, the Algiers was a crossroads for associated of organized crime, politics bosses, and leaders of law enforcement. The Thunderbird’s show policy increased dramatically after contractor Del Webb purchased it in 1964. Major Riddle later tried his luck there, rebranding it as the Silverbird in 1977. Yet another casino character, Ed Torres, attempted to reinvent it one last time as the El Rancho in 1982. With a bowling alley and a Wild West identity, it was an old-school operator’s idea of a can’t-miss theme. It foundered for several years, closed after a decade, and remained vacant until the wrecking ball arrived. So, as you can see, it’s a good thing the new Boutique Thunderbird isn’t really trying to follow in the footsteps of its namesake. On its website, the Thunderbird calls itself “retro-chic” and “playful, eclectic, social” to describe the vibe. It’s certainly a remarkable improvement for the careworn area, a strip blighted by grunge and faded commerce but one like others in the downtown corridor undergoing a new generation of reinvention. Sometimes it’s best to leave things past right where they are.